OK, I am dramatizing this a bit, they weren't really transforming, not into anything else than a giant moldy wall. It was bad enough though not to be gotten rid of with a bleach solution and a sponge, and the whole room needed work. The plaster on the outer wall and the cupboards had to go, and a new, waterproof layer installed, with new cupboards. Now it is, touch wood, fine, and apparently after (insert loads of technical wall-building and plastering talk that went completely over my head at the time) it is sorted for good. We still have a a few problems though. Our bedroom is nice, non-moldy, and functional. But it is very bare. I was just about to start my new job, and after getting the bedroom renovated we sort of ran out of time and energy to do anything further. We have a cupboard and a bed in there. There are no furnishings, bedside tables, nor even a shade for the ceiling lamp. In other words, it is in dire need of some revamping. You can see it in the pictures. Nice bedroom but there is just nothing personal there. It needs a lick of paint here and there, mainly to sort out some of wooden frames for the cupboard, and the stain from a water damage on the wall. And putting up the picture. After that is sorted there are a few things I want to get to make it more homely, more inviting. I've been looking at getting some soft furnishing to make the bedroom look a bit more inviting. Some pillows, new white bedsheets, and a bedspread. In the past I've always taken a utilitarian view and thought bedspreads and decorative pillows on the bed are, well, naff, but maybe I am finally becoming an adult. I thought cream coloured pillows and king size breadspreads, like this one from Yorkshire Linen might go nicely in our nutmeg-coloured bedroom. Pillows, like these ones from IKEA, could also be used to inject a bit of patterns and colour into the room. Another thing we definitely need is a bedside table. There isn't much space on the other side of the bed, so we will have to be careful with measurement, but something like this from Oak Furniture Land would look pretty nice in our bedroom. We also need a ceiling light - it has been difficult to find anything we like, but perhaps some sort of a pendant shade would do, like the one from John Lewis. 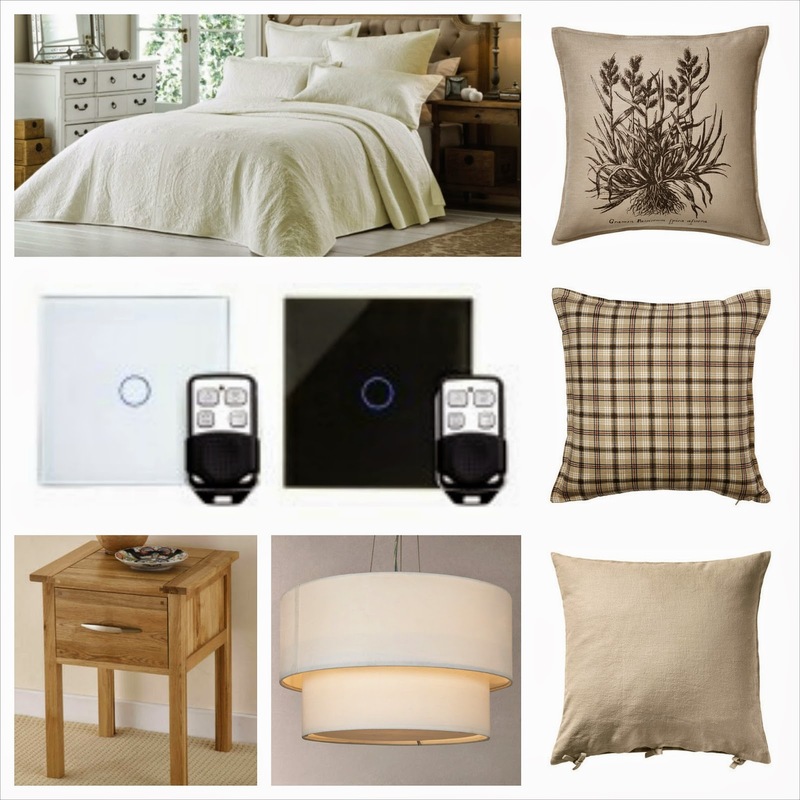 And my final thing on my wishlist - is to get to bed early, get comfy with all the pillows, read a book, and when ready to go to sleep, dim the lights without having to get up and walk to the light switch - how cool would it be to have a remote-controlled dimmer switch (like this one from LedPlanet)!. Are you guys planning any renovations? I've just done my bedroom and it was a big change! It now feels so nice to get into bed each night and it all be clean, pretty and tidy around me! I love your choices, very natural tones but will bring some warmth and cosyness to them room.